I admit I was impressed by the technological wizardry that enabled footage from Taxi Driver, Meet the Fockers and several other Robert De Niro films to be seamlessly incorporated into this scene. Good-natured mash-up of raunchy frat boy comedy (think Old School) and new parents comedy (think Up All Night, or what happens between Knocked Up and This Is 40). It’s reasonably funny – I laughed here and there – but it doesn’t rise to the level of my favourite comedies because it doesn’t have quite enough jokes or silliness or memorably ridiculous characters and situations. As always, Seth Rogen is Seth Rogen. Rose Byrne is well cast and gives her best comedic performance since Two Hands. 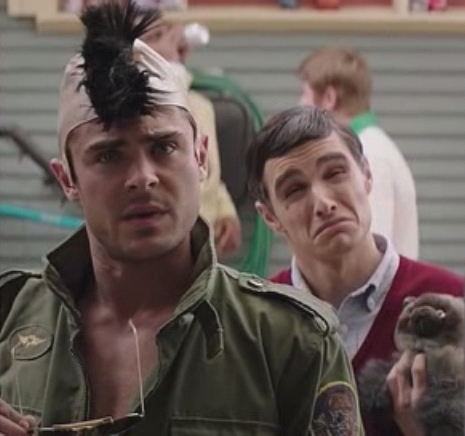 Zac Efron is fine too, though his character is a touch one-note at times. Many of the supporting characters feel like missed opportunities. While the non-central frat boys aren’t actively unfunny, they could have been so much more. Same goes for Rogen and Byrne’s divorced friends; I like Ike Barinholtz (The Mindy Project, MADtv) but he’s not used all that well, and Carla Gallo is awful (though, to be fair, she had very little to work with). Why is Hannibal Buress’ cop character given nothing funny to do? And why does Jason Mantzoukas get so little screen time? The relationship between Rogen and Byrne is handled nicely, even if the emotional moments between them don’t feel especially relevant to the main storyline (the battle with the frat). The only ways to fix this would have been focusing more on them as a couple and the difficulties of raising their baby next door to a frat house (the baby is pretty much forgotten after the first act), or making a different relationship (such as the strained quasi-friendship that develops between Rogen and Efron) the emotional core of the movie. Still, this feels like an odd complaint to make about a comedy; I suppose I’ve been spoiled by comedies with more ‘heart’, and now have somewhat unfair expectations. Thanks a lot, Community and Parks & Recreation! I wish there were more jokes. I wish the frat party scenes had been just a little crazier – perhaps more in the vein of Project X. And I wish I wasn’t completely over Christopher Mintz-Plasse. But I shouldn’t be so critical; as far as comedies go these days, this one’s definitely at the better end of the scale. If I’m picking a Nicholas Stoller movie, I’d still go for Forgetting Sarah Marshall, but this is worth watching too. This entry was posted in 2014, 7, Reviews and tagged Bad Neighbours, Carla Gallo, Christopher Mintz-Plasse, Comedy, Dave Franco, Film, Forgetting Sarah Marshall, Hannibal Buress, Ike Barinholtz, Jason Mantzoukas, Knocked Up, MADtv, Meet the Fockers, Movie Reviews, Movies, Neighbors, Nicholas Stoller, Old School, Project X, Robert De Niro, Rose Byrne, Seth Rogen, Taxi Driver, The Mindy Project, This Is 40, Two Hands, Up All Night, Zac Efron on August 26, 2014 by moviesandbacon.